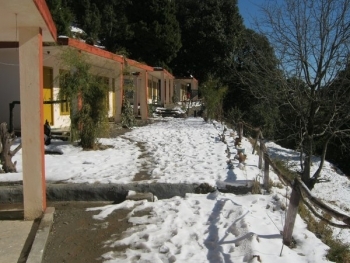 Janardan Resort at Pangot is one of the reputed resort chains in Uttarakhand that has made quite a name for itself because of its unique location and service that is ever so dedicated in dispensing its duties without interfering keeping in mind the privacy of the visiting guest. 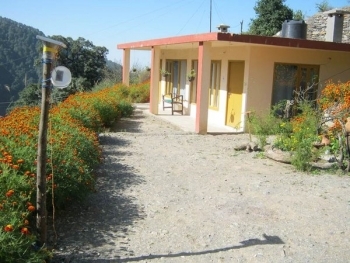 It is a hospitable facility and cottages situated in lush green hill locale offering quality and deluxe accomodations to families, travellers and tourists. Pangot is located about 15 kms from Nainital, which is a popular hill station in the Kumoan region of Uttarakhand. Nearby tourist attractions are Cheena Peak Range via Snow View Point (11.2 Kms) and Kilbury (20 Kms), which are famous spots among bird watchers. The resort provides 8 rooms and 4 tents accomodations for family and guests to relish the naturally blessed ambiance of Pangot. The accomodation is provided according to the behest of the customer as rooms in keeping with the requirements and budget of the visiting guests. The rooms are categorise in Deluxe and Economy rooms. The restaurant in Janardan Resort offers platters of mouth watering cuisines that are prepared on behest of guests in keeping with menu. - Fully furnished, spacious, attached bathroomwith 24X7 running hot and cold water, direct cable television, optional kitche, breath taking view with top class service. Pangot is well connected by motorable road to Delhi (322 Kms), Dehradun (310 Kms), Haldwani (48 Kms), Nainital (15 Kms) and other major towns of the state and region. Private & Roadway buses, Taxies are available from major towns of Kumaon region. Nearest airport is at Pantnagar which is 72 Kms from Pangot. From here, either board a taxi or bus to Pangot or Nainital. Nearest railway station is at Kathgodam which is 40 Kms from Bhowali.